Paige Dolecki - Stampologist: CTMH Blessed April Stamp of the Month Blog Hop! Welcome to our Stamp of the Month Blog Hop! We will be featuring April's SOTM called Blessed. If you have come here from Shannon's Blog, you are on the right path! This month we have over 50 Close To My Heart Consultants sharing their creations using this month's SOTM and other great CTMH products on their blogs. To visit the whole hop, just click on the link at the end of the post on each blog to move to the next one! This card has been kicking around in my head for a little while now and finally came to the light of day when I saw the cute little butterfly in this month's set. I added a strip of 1x1" colored cardstock squares mounted on a strip of black cardstock and a bow out of our fabulous new Sweet Leaft bulk ribbon (a spool of 10 yards is just $7.95). The colored cardstock circles are made with our 1.25" punch and the butterflies are each pop-dotted onto their white 1" circles. Its kind of hard to see but there is a wee dollop of Glitz on the head of each butterfly. The word smile comes from another stamp set called Take a Picture and has been coated with Liquid Glass for some pop and shine. Now "Hop" on over to Jean's Blog to see her work! Be sure to visit all the Consultants at their Blogs to get some great crafting ideas and other fun ideas! Remember, the SOTM is only available until April 30th! Visit my CTMH website at Paige.MyCTMH.com to see how you can get this stamp set at a discount or even free! What a clever idea. Love the rainbow of colors and butterflies. oh my goodness, please consider this one lifted. I LOVE IT! This is really eye-catching, Paige! Nice work! Love the color. This is a really cool card! The colors and SO springing and just plain AWESOME!!! Positively gorgeous!! Love, love the bright colors that you used. This is so much fun. I love it. This card is so colorful. It makes you smile! WOW!!!! This is so worthy of being lifted! AWESOME! Love this card - TFS! So darn clever and colorful. Fun!! Great job! FABULOUS! I never pictured this set in a rainbow of colors, but your card is so cheery! Your card is so sweet! 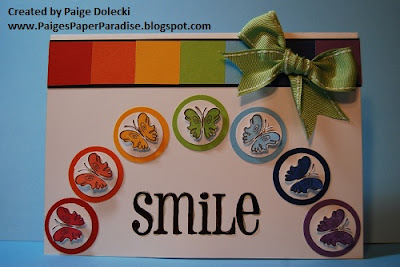 I love the rainbow of butterflies and the cardstock rainbow strip above!! Siply Beautiful! Love your design! Wow, is this pretty! Love the layout and how you used the rainbow colors! Thanks for playing our JUGs challenge! So cute! I love the sweet butterflies! Thanks so much for playing along in the Just Us Girls rainbow challenge. I really like your pretty rainbow of butterflies and that super bow! Fab!